Another photographer shows some close up lion photos. He is not the first one who takes nature photos with remote control and probably he is not the last one as this technology becomes more and more popular. Two month old captive born baby lion and its mother are seen in their cage in the City Zoo in Budapest, Hungary on June 13, 2013. I photographed yesterday the newest babies in Zoo Budapest, the three lion kittens just freshly named. 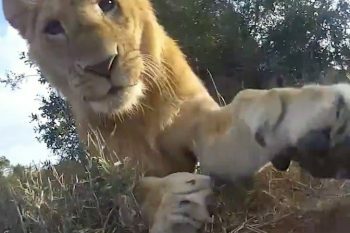 There are many different videos captured with GoPro action cameras, even nature documentary filmakers have used it for certain shots. 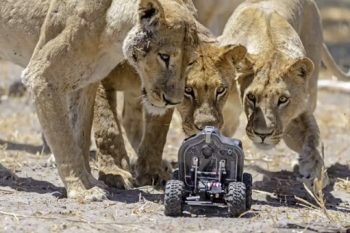 It is a new idea, however, to mount it on a cheap remote-controlled toy car and drive it among lions on safari in Africa!